While we may soon be bidding the warm weather adieu (like we didn’t in April), one thing that we shall not be letting go of quite yet is a broader colour palette. Bold hues have been a dominant force in menswear for a number of seasons now, and its pull is continuing to grow as a wider variety of colours begin to establish themselves in the male wardrobe. When the weather worsens and grey skies begin to cloud, a pair of coloured trousers is a great way to brighten the mood as well as your look. They sit well alongside almost anything in your existing capsule wardrobe and can create a striking look when combined and contrasted with heavy-duty clothing and materials. The continuation of this trend for the past two summers makes coloured trousers even more appealing for the looming winter months. We hope to rightly assume you are already well stocked in a plethora of brighter legwear. Inversely, if you’re yet to get on the bright bandwagon, now would be a great time – not only would you be purchasing trousers that would effortlessly see out the summer, but you are investing in a piece that is set to last for plenty of seasons after. It’s safe to say, now that men demand fewer boundaries than ever, coloured trousers (and colour in general) aren’t going anywhere anytime soon. Wear coloured trousers anchored by masculine outerwear for an on-point style statement. A timeless military-inspired piece is perfect for this; our top recommendations would be the peacoat or trench coat. Sticking to neutral tones with your coat of choice will help subdue the trousers and make the whole look much easier to pull of. But of course, a statement coat could easily be worked with coloured trousers for a more fashion-forward approach. Last season saw the emergence of the British countryside as a major influence on designer and fashion collections in general. Tweeds, wools, checks and knits ruled the roost, with heritage inspiration set to continue long into the upcoming season. 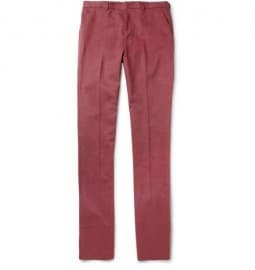 It’s alongside this out-of-city style tailoring that coloured trousers exhibit their full range of versatility. Not content to be paired merely alongside current, modern pieces in order to create a progressive style, they also look great when paired with the not-so-new accompaniments that have, once again, become absolute classics. The mark of a true essential is arguably measured by its versatility. Coloured trousers have transcended a number of seasons and we’ve already showcased how they can work with both tailoring and statement items. But what about as a day-to-day casual item? No problem. With bolder style becoming much more commonplace, men as a whole are no longer strictly monochromatic. Looking at the pictures above it seems that playing with colors resulted to a nice ensemble. As long as one knows what to wear with chinos then it is all perfect.